The KPI-X toolkit contains templates for strategic planning and strategy execution (X Matrix), and worksheets for performance management (KPI Tracker). Worksheets for strategic planning, strategy deployment, and performance tracking make the KPI-X an essential starter-kit, suitable for any team and business. 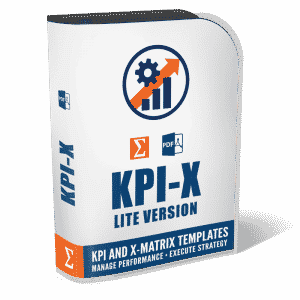 The Lite version contains ready-to-use templates, while the Pro KPI version is fully customizable. For more information, see the Strategy Deployment Framework (SDF) and Performance Management System (PMS).